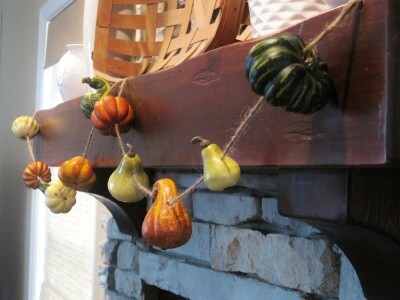 Martha created this garland of gourds from real gourds, probably from her garden. It is lovely, but I don't have a garden. With the 100 plus degree temperatures, it really doesn't matter anyway. A real gourd garland hanging outside would last about 2 days before the heat turned it into a science experiment. We do need an experiment for the science fair this year, but we already have a different one in mind. So Kimba did what all of us that live in warm climates, like to reuse our Fall decorations, and shop at craft stores would do. She bought some fake gourds and, with a little hot glue, created a Martha Stewart knock-off. 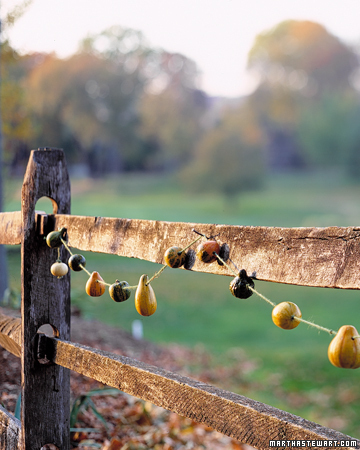 You can check out her faux gourd garland over at A Soft Place to Land and save your real gourds for other Fall decorating ideas.